In light of the recent Lamitan bombing in the Southern Philippines in July 2018, this issue highlights the changing terrorist threat in the Philippines. 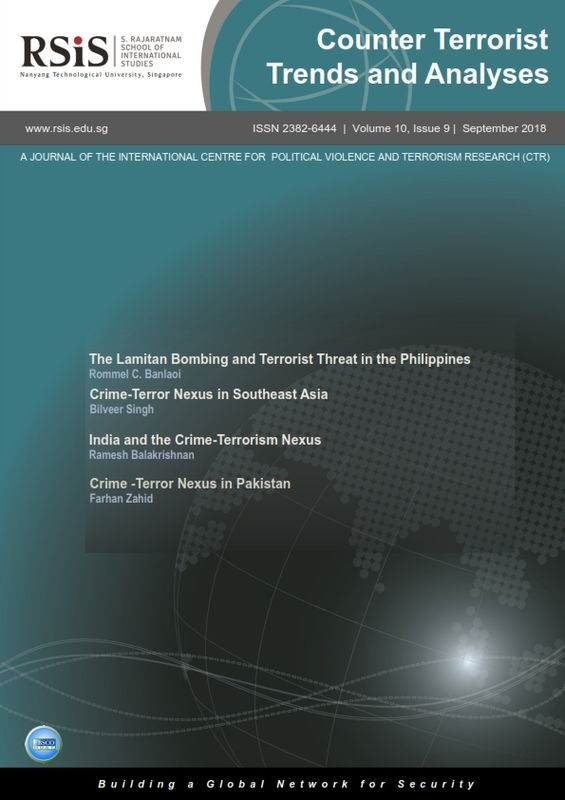 This issue then focuses, on the crime-terror nexus as a key factor facilitating and promoting financial sources for terrorist groups, while observing case studies in Southeast Asia (Philippines) and South Asia (India and Pakistan). The symbiotic relationship and cooperation between terrorist groups and criminal organisations is critical to the existence and functioning of the former, despite different ideological goals and motivations for both entities. While at times, terrorist groups cooperate with criminal gangs, they also develop their own criminal networks as a source of funding. Broadly, some of the manifestations of the crime-terror nexus in Asia include, arms and human trafficking, illegal drugs and artefacts trade, extortion, targeted assassinations and kidnapping for ransom. With the advent of globalisation, increased foreign linkages between terrorist groups and criminal organisations have also been witnessed, particularly through illicit trade and activities on the dark web. Overall, it is argued that central to countering terrorism, is the necessary weakening of the crime-terror nexus through identifying and curtailing the sources of finance for local terrorist groups. It is proposed that countries need to move beyond neglecting the crime-terror nexus, to help enhance existing legislation and engage in training and capacity building to effectively counter terrorism at both the national and regional levels. First, Rommel C. Banlaoi discusses the 31 July Lamitan bombing in Basilan province in Southern Philippines by the so-called Islamic State (IS) against the background of the terrorism threat in the region. The authorities initially denied IS presence in the first terrorist attack in which an alleged Moroccan national weaponised a van in Southern Philippines. Overall, the article traces IS networks in the Philippines, links to the Abu Sayyaf Group (ASG) and efforts to create a wilayah through associated groups and affiliates, specifically detailing the Siege of Marawi. The Lamitan bombing symbolises the continued ideological and physical threat of IS to the Philippines, despite the group’s physical defeat in Marawi in 2017. The author contends that the counter-terrorism bodies can defeat IS only through accepting the group’s presence and hold in the southern region of the country. Bilveer Singh broadly observes the nature of the crime-terror nexus in Southeast Asia, and analyses the Abu Sayyaf Group’s (ASG) sources of finance in the Philippines. The author posits that three modalities of terrorist financing in Southeast Asia are criminal activities, use of charities and partaking in legal commercial activities. This article looks at how criminal activities have been a major source of funding for ASG to advance its financial status and organisational, ideological and political positions – especially in Mindanao. Through its criminal activities, ASG is also able to acquire important skills and knowledge that can enhance the group’s operational capabilities. To counter the crime-terror nexus, it is crucial that the state practices good governance and engages in intelligence sharing and related cooperation with bordering states. It is also important to harden the maritime space in the tri-border region of south Philippines, east Malaysia and Sulawesi, Indonesia. Next, Ramesh Balakrishnan analyses the crime-terror nexus in different parts of India arguing that it occurs in four different forms: alliances, operational motivations, convergence and the black hole. According to the author, India’s proximity to heroin producers and exporters and the regional drug trade through overland routes and sea has facilitated the crime-terror nexus in the country. India is countering the challenge of the crime-terror nexus through a combination of policing and prosecution as well as military force, counter -insurgency (COIN) operations and legal mechanisms. The author suggests that India can further improve and enhance its responses to the crime-terror nexus through restructuring and provision of better training facilities for its state police forces. Finally, Farhan Zahid discusses the structural and functional relationship between criminal and terrorist groups in Pakistan and the country’s response to the strong nexus. The author opines that Pakistan’s India-centric security policies, promotion of militant groups to fight proxy wars in Afghanistan and Kashmir during the 1990s, political patronage of criminal groups in places like Karachi, Balochistan and the Federally Administered Tribal Areas (FATA) presently part of the Khyber Pakhtunkhwa province contributed to the growth of the crime-terror nexus in Pakistan. To tackle the challenge of the crime-terror nexus, the Pakistani state has adopted a number of law-enforcement, legal and administrative measures at the federal and provincial level. These measures focus on countering smuggling, illegal cross border movements, banking crimes, narcotics, illegal financial transactions, and intelligence collection. The author recommends that strengthening the law enforcement forces and raising their training standards could also weaken the crime-terror nexus in Pakistan.